This is the work I did for Gumball Heroes while at Big Fish Games. I was responsible for nearly all of the character designs, from concept and design to the final 3D texture, and helped to create the character style guide. Character design complexity and detail level escalated according to the rarity of the hero. Textures created in Photoshop. Challenges included designing 30-40 characters that remained readable and differentiated on a small mobile screen, and designing multiple characters while restricted to the same silhouette. Ultra rare characters, such as the Unicorn, were allowed to break the silhouette with add-ons. Earlier designs when the team experimented with different head shapes according to the character's type or abilities. Ultimately, this idea was scrapped because it detracted from the gumball concept. 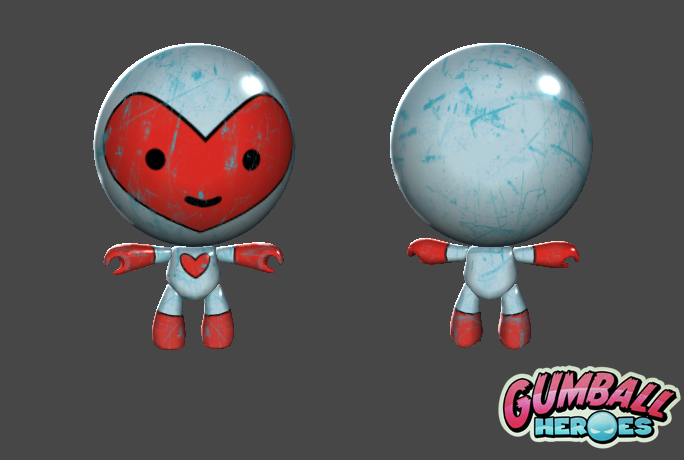 Enemy gumballs, from initial sketch to final 3D textures. After given the level theme ("Toxic mutants"), I came up with six variations. My art director preferred the first concept best and I continued to iterate along the "gumball zombie" idea.